By contrast, the 1989 film begins with Dolph Lundren, whose darkly imposing physical presence and laconic demeanour are ideally suited to the role of Frank Castle. Unlike Jane, we believe Lundgren has the consitution of a tank, capable of enduring great amounts of abuse while able to serve up abuse of his own. And the minimally expressive but not unemotional aloofness Lundgren delivers seems pitch-perfect for a man mired in such uncompromising morality that killing has become effortless and common. We see in Lundgren the weary compulsion of a man whose self-imposed mission to punish the guilty has stripped him of his social identity and the human bonds that come with it. Yet, for all the psychopathy implied in his murderous vigilantism, the film offers an occasional glimpse of humanity, of which there is enough left to keep Castle from becoming a truly amoral monster. A scene in which he holds a little girl’s hand, one of many children he rescues from the clutches of the Yakuza, and tells her not to be afraid is delivered with all the tenderness of a father who remembers both his own children and the value of innocence. Granted, in the 2004 film Frank’s neighbours are similarly intended to demonstrate that Castle hasn’t completely unmoored himself from the most basic requirement of moral action. But the 1989 film is less insistent in driving home the point, preferring a subtle moment to a brash subplot that strives to excuse the ugliness that otherwise pervades the film. Some fans, of course, latched on to the absence of the iconic skull on Lundgren’s person, as if the all-black cross between a combat uniform and biker wear was not sufficiently representative of the character’s persona of death. But I happen to find it more plausible that the skull motif would appear in Lundgren’s signature daggers – the skull is at the hilt ¬– then on the chest where it would draw undue attention. Wikipedia’s entry on Punisher, amusingly, mentions that Castle uses the skull to draw enemy fire towards the most heavily armoured portion of his body. Given how graphic design is used in urinals to help men’s aim, there is perhaps some sense to that. Nevertheless, the utilitarian costume design in partnership with Lundgren’s physique is more than sufficient to convey a tough, fearsome impression. What makes the 1989 version of Castle so much more interesting, beyond casting Lundgren in the role, comes from a script structured to prevent multiple perspectives on the character. Screenwriter Boaz Yakin wisely foregoes turning the film into an origin story, recognizing that the Punisher’s origin is not a story but, rather, a moment – the moment his wife and children die in a car bomb. This frees the film to manage the character both as an individual and as a concept. To the media, he is a mysterious vigilante called the Punisher. To the police, his high body county and defiance of the legal system inspires aggravation and embarrassment. Of course, to mobsters the Punisher evokes fear and dread. Finally, there are the personal perspectives of the character through Frank himself, delivered through voice-over monologues, and through his former partner in the police Jake Berkowitz, played by Louis Gossett Jr. The latter is arguably the film’s true heart, as Jake desperately searches for his former friend, believed dead by just about everyone else, and bring him to safety from the alienating bloody battlefront of his perpetual war against the mob. Altogether, the various perspectives add up to a surprisingly robust portrayal that elevates the film’s presentation of the character from mere exploitation to social commentary. It helps immeasurably that, unlike Hensleigh’s film, the plot is not driven by excessively dominant villains. Instead, the plot doesn’t overcook the film. We get a gritty, almost depersonalized war between a man and the mob, with the Punisher having to confront the consequences of what happens when the mob is so weakened that the Yakuza start to move into the power gap. Of course, it cannot go unmentioned that the film suffers from its low budget and director Mark Goldblatt’s lack of cinematic vision. The obvious casualties are the cast, which range from cringe-inducing bit parts to awful child actors, and action scenes that occasionally forget about the laws of physics. Even that classic gaffe, where the hero emerges unharmed from a hail of apparently badly aimed bullets, makes an appearance. For all that, however, Goldblatt mostly stages effective action scenes. A welcome lack of frills or stylistic flourishes gives the gunfights and fisticuffs a gritty, street-brawl character. In fact, it’s a bit of a morally wishy-washy misnomer to call them “action scenes;” its violence, straight without a chaser. Despite the necessary brutality of garroting, gunshots, and stabbings, the film restrains itself from giving in to the gory impulse that afflicted other “action” movies of the 80s and their successors. And why shouldn’t it? It’s a questionable cultural defect, illustrated vividly by Hensleigh’s version, that requires the use of highly graphic depictions of violence to elicit a moral and visceral response. Goldblatt doesn’t sanitize the film’s violence to make it palatable, but does keep it at a clinically detached level that makes the violence all the more unsettling without playing into the manipulative revenge horror formula. To this version of the Punisher, and the gangsters he combats, the violence is matter-of-fact; The Punisher, at one point, machine guns a roomful of kendo-practicing Yakuza without so much of a twitch. Goldblatt’s honest presentation leaves room for audience involvement. Where some might be thrilled by such mechanical slaughter, it seems more fitting to be horrified, a reaction more in line with the Punisher’s ultimate status as anti-hero. In a similar mix of the workable and the problematic, the cast is not universally low-grade. The major roles, at least, benefit from good performances that give the story enough heft to overcome the film’s weaknesses. Louis Gossett Jr. in particular is an asset, proving to be the film’s heart as a man with a motivation, driven by an abiding sense of loyalty and friendship, to rescue Frank Castle from his outlaw existence. Also noteworthy is Barry Otto as a homeless alcoholic actor named Shakes, presumably short for Shakespeare, who provides the Punisher with information while also, at a key moment, serving as surrogate conscience. Rounding out the cast of capables are Kim Miyori as the icy cruel Yakuza leaders Ms. Tanaka, and Jeroene Krabbe as the pragmatic but proud Gianni Franco, surviving head of the Franco crime family. Miyori is suitably sinister, without being garish, as the film’s prime antagonist. But it falls to Krabbe to put a human face on the gangsters the Punisher fights. More level-headed than his mob associates, Franco also calls into question the Punisher’s decision to appoint himself a distributor of capital punishment. Not because Franco is lacking in ruthlessness, which he isn’t, but because even he operates under moral code. Although not explicitly clear, the impression from Krabbe is that Gianni Franco would not have ordered a hit in which a child would be killed. That impression underlies a key scene that offers as much insight into what Castle has become as it does the mobster, a role reversal of sorts in which, while waiting for the moment to launch an assault on the Yakuza, Franco says in response to Castle’s high body count, “There’s a limit to revenge, you know.” Castle’s wry, deadpan answer: “I guess I haven’t reached mine.” How about that? The mobster has limits, whereas Castle is intent on continuing his war no matter the limit. Kierkegaard, called the father of existentialism, played up the absurdity of human existence, stating the only way to combat this was the total commitment of the individual to a life of his choosing, and though Kierkegaard, still a child of his time, ultimately fell back on the abject acceptance of Christianity (which he also seemed to feel was incomprehensible) as the only valid course of action, the "life of total commitment" certainly fits The Punisher. Heidegger, who took Kierkegaard's philosophy further, comes even closer to describing The Punisher: since we can never hope to understand why we're here, if there's even anything to understand, the individual should choose a goal and pursue it wholeheartedly, despite the certainty of death and the meaninglessness of action. That's sure the Punisher as I conceived him: a man who knows he's going to die and who knows in the big picture his actions will count for nothing, but who pursues his course because this is what he has chosen to do. The film’s closing shot is of Jake desperately calling out his friend’s name. He receives no answer, of course, Frank having disappeared after killing both Ms. Tanaka and Franco and, ominously, leaving the mobster’s son with a warning to become a good man or find The Punisher waiting. The war goes on. For all the film’s shortcoming, we’re left with a film that, unlike Hensleigh’s, comes closest to depicting that Kierkegaardian mode of existence. 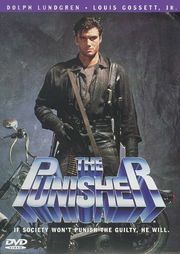 Saying everything that really needs to be said about the character, the 1989 film stands as a faithful, albeit technically flawed, translation of the Punisher to a live-action medium. So where does the Punisher go from here?